We are pleased to announce the availability of mechanical seal kits and bearing frame kits for many of our most popular models. The mechanical seal kit and bearing frame kit are offered separately. We recommend ordering both kits for a major service. Both the Mechanical Seal and Bearing Frame kits include all of the O-rings needed for service. We also have upper vacuum pump and lower vacuum pump kits available. 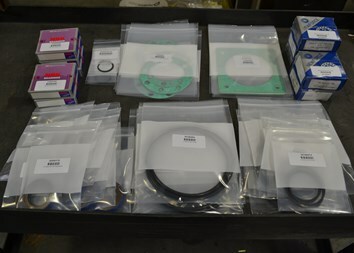 Parts Kits are in stock and available for shipment within 2 business days. Please call or fax orders. Phone (503) 266-4115, Fax (503) 266-4116. Model Mechanical Seal Kit Part No. Bearing Frame Kit Part No.